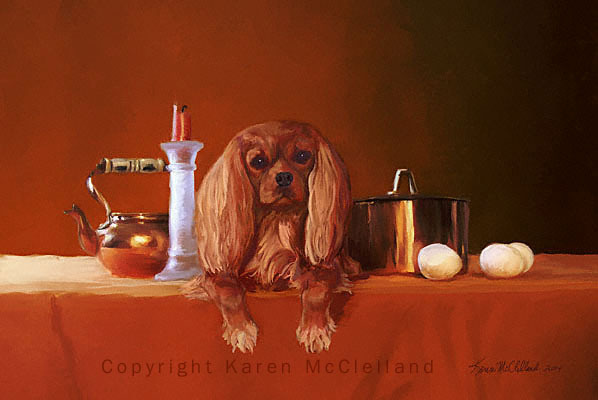 Ruby Cavalier King Charles Spaniel limited edition art print, dog painting done by artist Karen McClelland titled "Ruby Still Life"
Cavalier King Charles dog print titled "Ruby Still Life"
I love playing with rich, lush, vibrant color; and have always had a desire to do a still life. 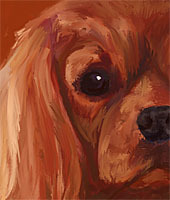 I got to combine both of these things by putting a charming little ruby Cavalier King Charles in this painting. Below the edition information is a closeup of a portion of the painting. Other Cavalier prints.